Yes, I’m still alive! 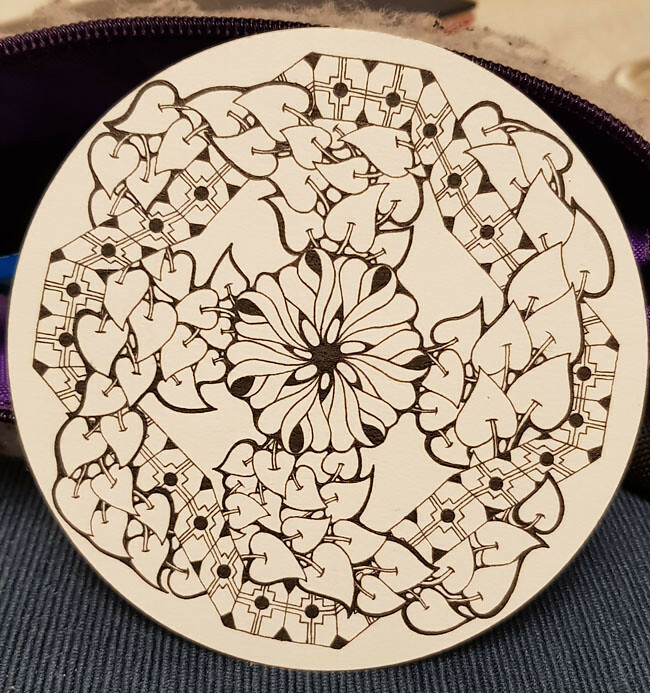 I’ve been busy with tons of other things that were quite important but I’ve always been watching what’s happening in the zentangle world. Since the stress around the start of the year is slowly going back to a more normal level, I thought it was high time to join in again! This is my first ever take on the monthly challenge you can find as #fullmoonmosaic on Instagram. It was started by Hanny Nura CZT, the originator of Zenjoy. I really liked both the original idea behind this challenge as well as the beautiful results that came from it so far. I’m glad I’m finally part of it, too! 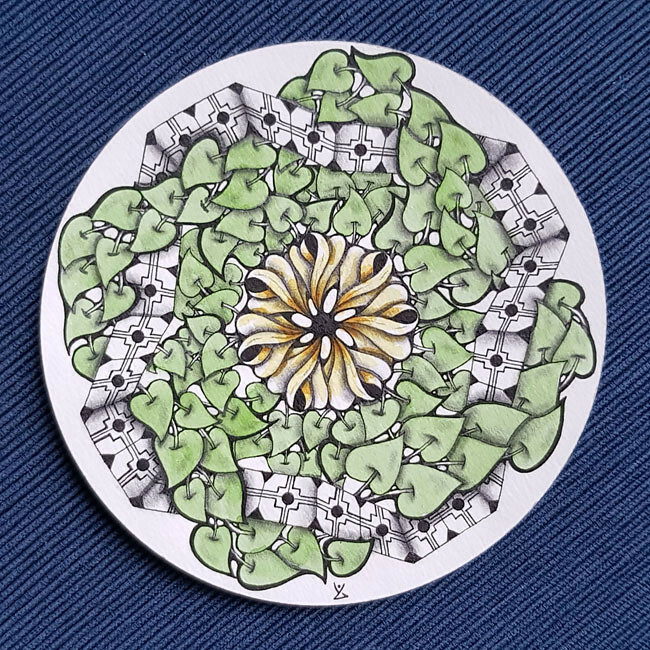 The challenge for February 2019 was to take a Zendala tile, divide it into eighths and then place Buster by Irina Wins in the center. 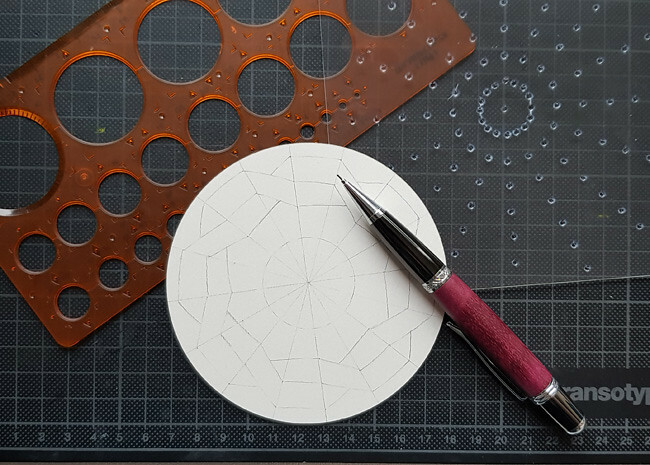 For the rest of the tile, you should use the fragment Tatu and – if you like – other tangles, too. Ready to go! This was the first time that I was able to use my new selfmade zendala stencil. It really helped A LOT to quickly set the string up without folding the poor tile, too. 😅 Am looking forward to playing some more with it! 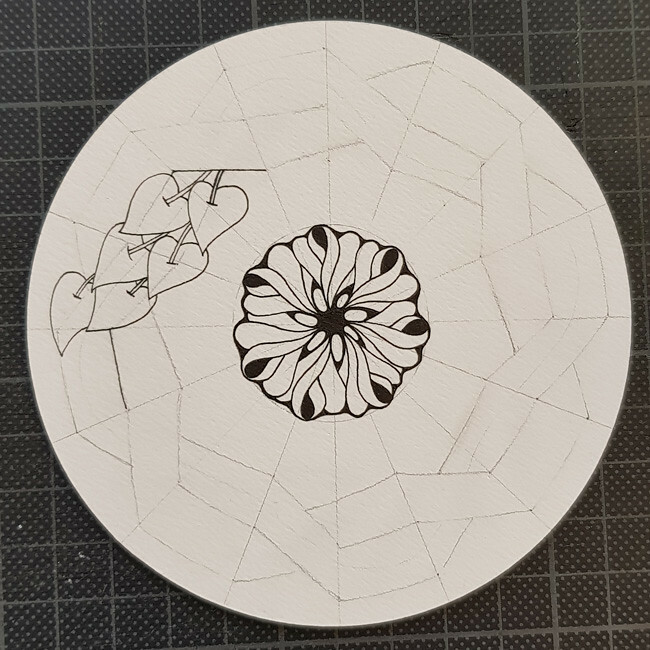 I actually had 3 goes at this challenge with 3 different strings each and I see so much potential for this stencil to create many more fun strings both on a Zendala tile and on a regular Zentangle tile. While Bluster by Irina Wins was a lot of fun to tangle, Tatu and I decided to leave it at this short collaboration… Especially the “step” around the center circle drove me mad until I found a good workaround for me: I placed four dots around it marking the edge of the each step. Still, no real love sparked between us. Well, at least we tried! I added colour because after shading (no picture here, sorry) everything lacked contrast, even though I already rounded and added thick outlines around Pokeleaf. So I glazed very lightly with some #watercolour over the organic parts of the tile, Pokeleaf and Buster. It has a little spring feeling to it, don’t you think?